Shortlisting ideas that resulted from brainstorming sessions. Working together to tailor content to the needs of prospects and customers at each stage of the funnel. “Testing” ideas on prospects. A simple “Is this something you would be interested in/would it benefityou?” can go a long way. Reviewing research and briefs and adding their two cents where possible. They don’t have to be there every step of the way, but some input from Sales at key stages of the creative process could prove to be priceless. Remember to encourage your salespeople to share content where possible, too. Create content that allows for sales department customization wherever possible. This is mutually beneficial. It increases the visibility of the marketing team’s work, and may help salespeople close leads when the content answers questions in more detail than they’re able to themselves. If as a business, you are not able to achieve the said revenue targets, or you are unsatisfied with the outcome of your marketing strategies, then it is high time that you get your sales and marketing teams working from the same sales book. 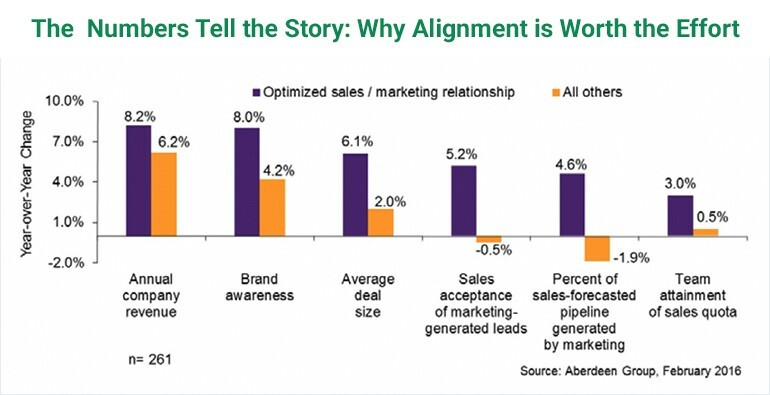 Aberdeen Group also revealed that the companies that have applied the perfect synchronization between marketing and sales were able to grow the revenue 32 percent faster. Customers aren’t always excited to hear from a sales rep, but according to LinkedIn, 92 percent of B2B prospects will engage with someone who is seen as a thought leader. Marketing can use the info you give them to create content that makes your sales reps into experts who share information that speaks to your prospects’ needs. It’s a win-win-win: the content makes your reps look good, prospects start seeing your reps as experts, and you can turn that newfound industry authority into trust – which will help you convert more deals..
An explosion of digital channels has made information plentiful and easy to find, forever shifting the balance of power between buyers and brands and allowing consumers to wrest control of the wheel to direct their own buying journeys. It’s also raised consumer expectations. Prospects no longer want to hear about what you offer—they want to hear that you understand them. To keep up with the rising expectations of personalization, today’s B2B companies must focus on addressing buyers’ pain points, not on selling their own solutions. This customer-centric model requires all teams to work together in order to provide a consistent, outstanding customer experience—starting with marketing and sales. Join us on February 26th!